he dynamics of international trade is multifaceted and intertwined with geopolitics, the relative strength of the U.S. dollar, U.S. demand for imported goods, tariffs and free trade agreements (new and revised). Trade’s importance as a driver of economic growth is significant, as exports contribute to economic health and job creation. 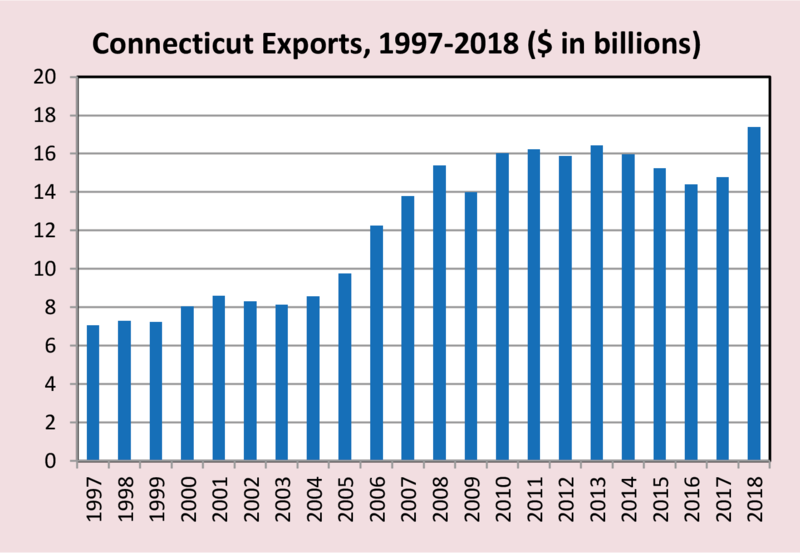 To assess Connecticut’s export status, The Connecticut Economic Digest conducts an annual review of the state’s export performance. A review of the state’s 2018 export position follows. Connecticut’s export ranking among the states has held steady for many years. As in previous years, in 2018 Connecticut ranked 27th in the U.S. Texas, California, New York, Washington and Louisiana were the top five export states in 2018, ranked in terms of export commodity dollars. Among the 50 states, Maryland experienced the greatest percentage increase in 2018 at 29.60%, largely driven by a surge in coal exports. U.S. commodity exports experienced continued growth in 2018 and totaled more than $1.66 trillion in 2018, representing a 7.62% increase over the $1.54 trillion recorded in 2017. Due to geographic proximity and NAFTA, it should come as no surprise that Canada and Mexico were the top two destinations for U.S. exports in 2018, followed by China, Japan and the United Kingdom. In New England in 2018, only Massachusetts’ exports value ranked higher than Connecticut’s, as has been the case since 2005. As a regional trading block, New England’s commodity exports totaled more than $57.97 billion in 2018, a 4.68% increase from 2017. The top five export destinations for New England commodities were Canada, Germany, China, France and Mexico. Connecticut’s top export commodities mirror the state’s advanced manufacturing strengths and there is a demonstrated consistency among the state’s top exports. 2018 was no exception. Last year at the two-digit Harmonized System (HS) commodity code level, Connecticut’s top five export commodities were (1) aircraft, spacecraft and parts thereof; (2) industrial machinery, including computers; (3) optic, photo, medical or surgical instruments; (4) electric machinery, sound equipment, TV equipment, parts and (5) special classification provisions, not elsewhere specified or indicated (Nesoi). The bulk of special classification provisions were composed of exports of repaired imports. Please refer to the associated charts for greater detail on the state’s export strengths and composition. Drilling down an additional layer into the HS commodity codes for greater export insight reveals the transportation sector’s dominance of Connecticut exports in the aerospace and defense industry. At the four-digit HS level, the state’s top exports included civilian aircraft, engines, parts; exports of repaired imports; and turbojets, turbopropellers. To put these figures into national and regional context, the U.S. and New England states’ top export commodities were similar to Connecticut’s. In 2018, the top five U.S. export commodities were (1) industrial machinery, including computers; (2) mineral fuel, oil, bitumen substances, mineral wax; (3) electric machinery, sound equipment, TV equipment, parts; (4) aircraft, spacecraft and parts thereof and (5) vehicles, except railway or tramway, and parts. In 2018, the New England region’s top five export commodities were (1) industrial machinery, including computers; (2) electric machinery, sound equipment, TV equipment, parts; (3) aircraft, spacecraft, and parts thereof; (4) optic, photo, medical or surgical instruments and (5) natural or cultured pearls, precious stones, precious metal clad materials, imitation jewelry and coins. The state’s top ten commodity export destinations were France, Germany, Canada, the United Kingdom, Mexico, China, the Netherlands, Japan, Singapore and Korea. Connecticut exported over $1 billion to each of its top four trade partners in 2018, with over $3.17 billion directed to France. 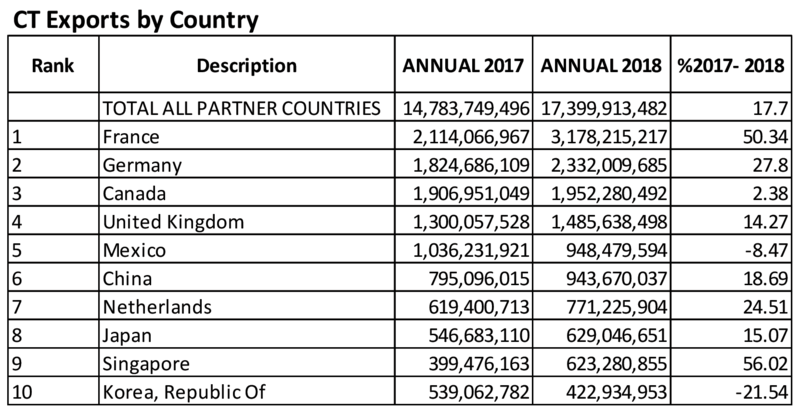 Among the state’s top ten partners, all but two experienced export increases, the most significant percentage increases belonging to Singapore (56.02%) and Germany (27.80%). Among the state’s top ten commodity exports, Connecticut exports of vehicles, except railway or tramway, and aircraft, spacecraft, parts increased to both Singapore and Germany. Singapore is notably a significant market for aerospace maintenance, repair and overhaul. The state and federal government continue to partner to help Connecticut companies take advantage of export opportunities. For example, DECD administers a State Trade Expansion Promotion (STEP) grant award from the U.S. Small Business Administration (SBA). The program’s goals are to increase the number of small business exporters and increase export sales. In conjunction with organizations such as the Connecticut Center for Advanced Technology (CCAT), local U.S. Department of Commerce Export Assistance Center (USEAC), Connecticut Economic Resource Center (CERC) and others, DECD directs STEP funds towards small businesses for export development and training opportunities, company participation in foreign and domestic trade shows and trade missions, website translation, as well as other export initiatives and events. 2 "Connecticut Exports, Jobs, & Foreign Investment,” U.S. Department of Commerce International Trade Administration, https://www.trade.gov/mas/ian/statereports/states/ct.pdf Feb. 2019.